The Webstone Isolator EXP E3 Lead-free Isolation Valve Kit for All Bosch Gas Tankless Water Heaters (45443WPR) comes with separate hot and cold isolation valves, adjustable pressure relief valve port and a Pressure Relief Valve. Easy two-step installation of your tankless water heater with unsurpassed safety, features and benefits. This is a complete inlet/outlet valve system that provides everything you need for a secure installation, including full port testing and flushing of the system with easy-to-install union connections. 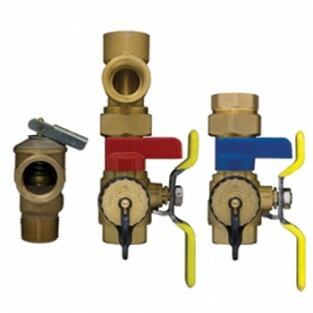 The Webstone 45443WPR Isolation valves are a set of Hot & Cold Full Port Forged Brass Ball Valves w/ Hi_Flow Hose Drains & Pressure Relief Valve Outlet 3/4" IPS Union x 3/4" IPS (500 WOG) & PRESSURE RELIEF VALVE (150 PSI/200K BTU) ISO 9001.